These big bakery-style pumpkin muffins are filled with those festive flavors of fall, like pumpkin, spice, and a touch of brown sugar—they’re deliciously moist and scrumptiously irresistible! With the cool and colorful days of the fall season finally upon us, it’s time to officially welcome all things pumpkin back into our lives! I don’t know about you, but come late September, I become extremely excited for pumpkin season. This time of year is all about pumpkin spice lattes, pumpkin spice-scented candles, and the sweet-n-spicy, freshly-baked goods, all bursting with that the “king” of all squash, pumpkin! And because I really enjoy baking during this time of year, I like to prepare something cozy, from scratch, to have on hand when looking for something sweet to partake in. 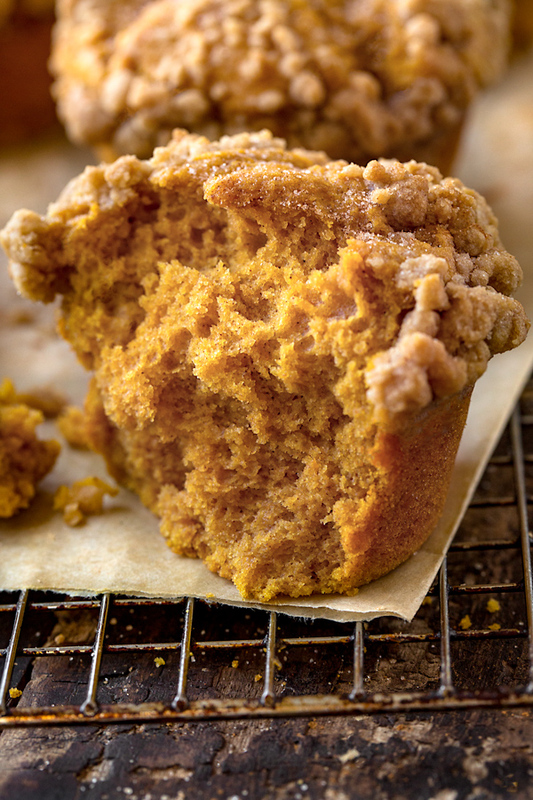 For me that often means pumpkin muffins, the big bakery-style variety—super moist and decadent! These muffins are perfect to whip up when I’m craving a truly seasonal treat that scrumptiously represents the flavors and colors of autumn, my personal favorite time of year. 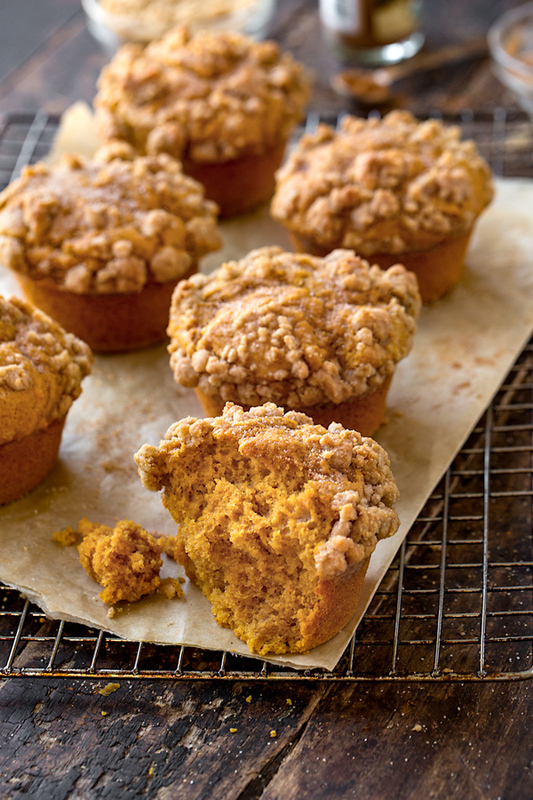 For Moist and Delicious Pumpkin Muffins, Grab a Can of Pumpkin! While there are many sweet and fragrant ingredients that go into a decadent pumpkin muffin recipe, the main ingredient is going to be pumpkin, of course. Good quality pure, organic pumpkin-in-a-can is my preferred way to go for these pumpkin muffins. It’s easy to find on market shelves not only this time of year, but any time of year, which makes things extra convenient. 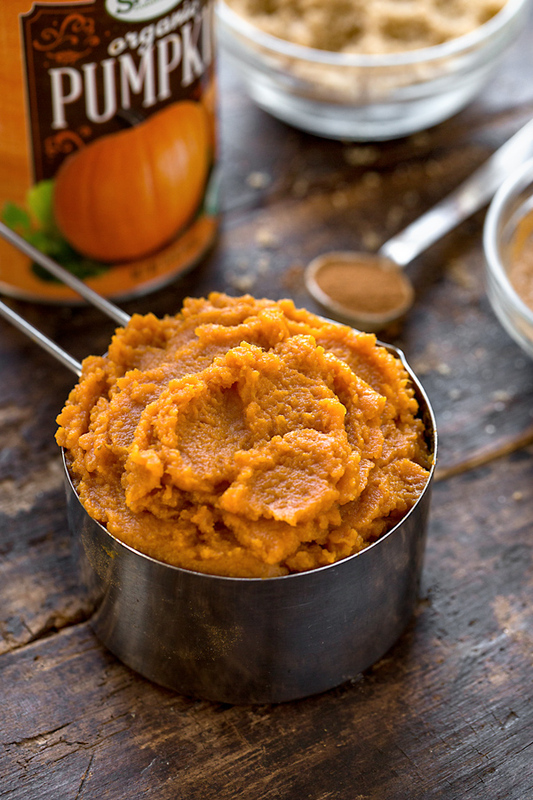 There’s no need to cut, roast and puree a fresh pumpkin for this sweet recipe, but if you prefer to do that, by all means go for it! 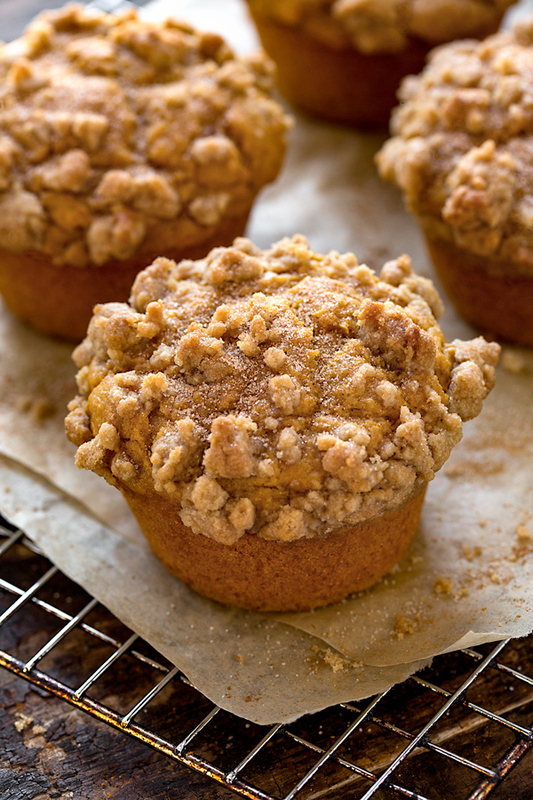 Either way, the best pumpkin muffins are filled with lots of spice, brown sugar and melted butter, complete with a crumble topping and even a sprinkle of cinnamon sugar. Pumpkin muffins are easy to whip up, as you don’t need a stand mixer or even a hand-held mixer—only a bowl, a whisk and a spatula! I preheat my oven to 425°, a nice hot temperature to start the baking process off with, as this helps to create that tall, bakery-style look to the muffins! Then, I prepare my crumble topping and set that aside. Next, I whisk together my dry ingredients in one bowl, and my wet ingredients (including the pumpkin puree) in another. I then add my wet ingredients into my dry ingredients, and fold things together just until incorporated. 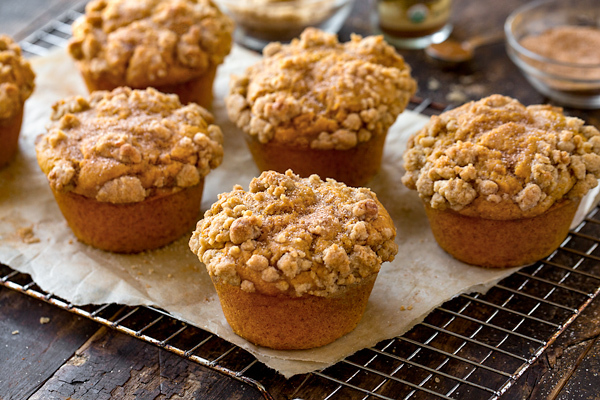 At this point, I spoon the batter into six jumbo muffin tins that have been prepared with a light misting of cooking spray, then sprinkle over their tops equal amounts of the crumble topping. Next, I bake the muffins for six minutes at 425°, then lower the temp to 350°, and bake for 22 minutes more, or until baked through. And to for the finishing touches, I sprinkle some cinnamon sugar over their tops while they’re still warm. Good quality, canned pure pumpkin: Good quality, canned pure pumpkin: When purchasing the pumpkin, look for organic, pure pumpkin. Make sure you don’t get pumpkin pie filling; it has sugar and other additives. What you’re looking for is the canned pure pumpkin. Buttermilk for a tender crumb: I like to use buttermilk in this recipe as it helps to create a nice, tender crumb and extra flavor. But if you don’t have buttermilk, you can substitute regular milk. High heat to start things off: The key for tall, pillowy bakery-style muffins is initially baking them at a high temperature. Begin by preheating your oven to 425° and bake them at that temp for the first 6 minutes; then, lower the temp to 350° for the remainder of the baking time, roughly 22 minutes. Sprinkle on the cinnamon sugar while still warm: To help the cinnamon sugar adhere to the muffins and create a bit of a “crust”, sprinkle it on generously right after the muffins come out of the oven—it will slightly melt to the tops! To make 12 regular-sized muffins: Prepare the recipe as directed, but only fill a regular 12 muffin tin, and reduce the bake time to a total of about 21-24 minutes. 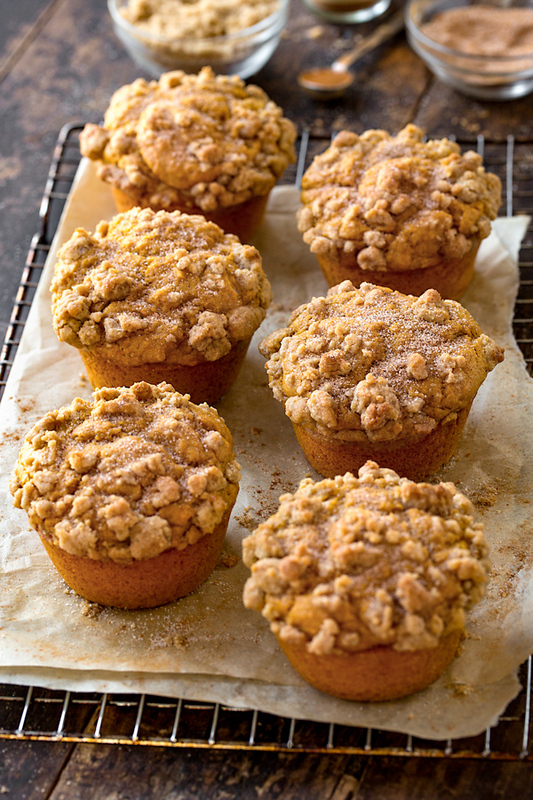 These moist and delicious bakery-style pumpkin muffins come complete with a crumble topping and a sprinkle of cinnamon sugar! -Preheat the oven to 425°, and liberally spray a jumbo muffin tin (6 wells) with cooking spray. -Prepare the crumb topping by combining the brown sugar, melted butter, pinch of salt and pinch of cinnamon in a small bowl, and using a fork, mix together; add in the flour, and mix with the fork until combined and crumbly; set aside. -Prepare your muffins by whisking together the dry ingredients—the flour, brown sugar, baking powder, pumpkin pie spice, salt and the 1/4 teaspoon of cinnamon in a large bowl, and set aside. -Prepare the wet ingredients in a separate bowl by whisking together the pumpkin, eggs, buttermilk, vanilla, and melted butter; add these wet ingredients into the dry, and using a spatula, gently fold everything together, just until barely combined, taking care not to over mix. -Drop large spoonfuls of the batter into your prepared tins in equal amounts, and sprinkle over equal portions of the crumble. -Bake at 425° for 6 minutes, then lower the heat to 350°, and bake about 22 minutes more, or until top springs back when gently pressed, for a total time of roughly 28 minutes. -While muffins bake, prepare the cinnamon sugar by mixing together the 1 tablespoon of granulated sugar with the remaining 1/2 teaspoon of cinnamon, and set aside. -Once muffins are baked, cool them in the pan for 10 minutes, then carefully remove the muffins and place onto a wire rack. -Finish by sprinkling on the cinnamon sugar while still warm, then allow to cool before enjoying. Looking for more sweet fall treats? Check out these Apple Muffins, these Apple Fritters, this Pumpkin Velvet Cake, and these Apple and Brown Sugar Snickerdoodle Cake! Hi Katie, I love that! Thanks so much for taking the time to report back on the recipe! How come when I mixed the crumb topping it turned out like paste not crumbly? Hi Nancy, when the crumble mixture is first mixed together it can have a bit of a “wet sand” consistency; but what creates that crumble texture is using your fork to work it a bit, and create crumbly “chunks”, so to speak. When you’re putting those ingredients together, I’d recommend that you then sort of almost “fluff” them with the fork to help to create the crumbles. The fork helps to chunk things up, so you’re basically creating the crumbles yourself this way. Then when you sprinkle the mixture over the muffin batter, it bakes to create that look you see in the photos.